3Environmental Studies Institute of Graduate Studies and Research Alexandria University Chairman &amp; CEO of Middle East Oil Refinery (MIDOR). The radiological and radioecological impacts associated with the uncontrolled release of TENORM in products and wastes released in the petroleum industry are of great concern. In this study, radiological risk assessment of TENORM in refined products, sludge, non-oil wastes and produced water are presented. Thirty-four statistically representative samples are divide into four groups; fourteen samples were refined petroleum products, nine samples were sludge waste, six samples were taken from used and fresh non-oil wastes and five samples were produced water. The activity concentrations of 232Th, 226Ra and 40K in all samples were measured by using gamma-ray spectrometry with high purity Germanium (HPGe) detector. The radium equivalent activity, external and internal hazard indices, gamma radiation absorbed doses rates and the annual effective dose were estimated. It was noticed that the maximum value of radium equivalent activity was found to be 308.773 Bq/kg and observed in ceramic balls used for catalyst bed support and it was lower than its recommended upper limit, which is 370 Bq/kg. The external and internal hazard indices were indicated. It is recommended that for workers who are working in maintaining and repairing equipment must use safety tools to protect them from the dangers of inhaling radon gas. Generally, the overall results revealed that the radiation levels would not pose any radiological risk occupationally or for the ambient environment. 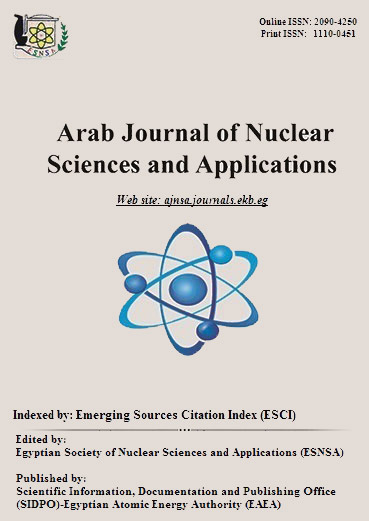 The results obtained in this study are very important in terms of establishing indicators and standards for radiation protection in this type of crude oil refining technology.